Why is it that it’s young children that always make the creepiest villains in horror movies? Perhaps it’s their eerily composed complexion, or their wide-eyed innocence, or maybe even how they always sound so adorable even when saying the most twisted dialogue, but whatever the secret ingredient is, it’s almost always going to be completely haunting whenever they command the screen with their evil nature. Maybe that’s why we’ve now had not one but two creepy-kid horror movies in the past month, first The Hole in the Ground and now The Prodigy (funnily enough, both distributed in the UK by Vertigo Releasing), and between the two of them, I honestly had a much more fun time at this one, if only because the kid in this movie is not just creepy, but genuinely unnerving. That was enough, for me anyway, to carry a movie that certainly has its moments of ridiculousness, but was made up for by the serious amount of entertainment I got out of this rather chilling little movie. The movie opens with Sarah (Taylor Schilling) giving birth to her and her husband John’s (Peter Mooney) baby boy, whom they name Miles. As he grows older, it becomes apparent that Miles is exceptionally bright; he begins talking before he is even a year old, and shows so many signs of serious intelligence that his parents enrol him in a special school for gifted children. However, when the boy turns eight – and from then is played by Jackson Robert Scott, best known as Pennywise’s young victim Georgie from It – Sarah begins noticing a pattern of increasingly disturbing behaviour in her son, including a penchant for extreme violence and talking in what she later learns to be Hungarian whilst sleeping. It’s not long before Sarah begins discovering some very unsettling truths about Miles, and soon she is forced to take action when he can no longer control whatever it may be that’s inside of him. What turns out to be actually behind this young boy’s evil tendencies isn’t exactly a secret – it’s more or less revealed before the opening title – but in case you’d rather go in as blind as possible I’ll refrain from going into too much detail about it here, but what I will say is that you shouldn’t be too surprised if you get some serious Child’s Play vibes from seeing how it all plays out. How you react to this particular twist will probably make or break the movie’s credibility for you, as it is a pretty silly concept that requires a suspension of disbelief from its audience for them to buy it as something these characters are seriously discussing through the events of the film. However, there might not even be a lot of time for you to process much of it at first, because for whatever reason the first half of this film oddly has a rather quick pace to it; key moments in the early years of Miles’s life will literally just flash by, and before you know it he’s finally eight and we still don’t know anything about him or his parents as actual characters, because it’s all gone by so fast that there’s no room for actual development before we’re lumped in to this story where we don’t know or care much about the characters – at least, in this first half of the movie. It’s not until the film reaches a point where, suddenly, things get a bit more intense and you actually start to feel some kind of emotions towards this film, including that most elusive of feelings known as fear. A significant amount of chills you end up getting from this film – even in the film’s somewhat messy first half – come from how magnificently creepy young Jackson Robert Scott is here; the young actor has the look of a sinister little sprog down to a tee, with those big sharp eyes staring daggers at people with a permanent sadistic expression on his face, and later on he has some seriously disturbing monologues he delivers to other characters (just wait until you hear a threat he delivers to a therapist trying to examine him; it’s utterly bone-chilling for that sort of thing to come out of a child of any age). This kid is having an absolute blast being as evil and sinister as the script allows him to be, which is probably why the only things I’ve seen him in up until now have largely been horror films; that makes me think if Scott was playing this character in the opening scene of It, then I’d be more terrified of that kid more than I would be of Pennywise. The rest of the movie, once it gets over that first-half slump, manages to become an entertaining, albeit nothing spectacular, horror film with some effective cinematography and a couple of decent scares. There are certainly things about it that don’t work, such as whenever it falls victim to a number of horror-movie clichés – the family with a creepy and sadistic offspring has a beloved dog; I’ll let you piece together that puzzle – and an ending that’s more bitter than bittersweet, but I was enjoying myself a fair amount in this, even though I could clearly tell what was working and what wasn’t. I really do think, however, the reason I enjoyed this movie more than I thought I would was because this kid is absolutely selling his evilness to me on-screen, and he is so good here that I found myself thoroughly entertained by his evil nature in ways I never would have anticipated with an otherwise okay horror movie. The creepy kid is certainly a cliché of the horror genre, but movies like The Prodigy prove that sometimes, it’s a cliché that works. 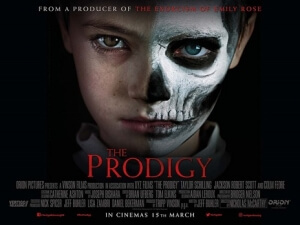 The Prodigy is a horror film that takes a stumble during its fast-paced first half, but once it settles down it becomes a decent, reasonably creepy movie that benefits greatly from Jackson Robert Scott having the time of his young life as the sinister little sprog who’s terrorising everyone around him, often to terrifying effect.